PARIS — Teenage sensation Kylian Mbappe told AFP on Thursday that Cristiano Ronaldo and Lionel Messi remain football's greatest players but that his own World Cup heroics could help crown him the 2018 Ballon d'Or winner. Mbappe, 19, inspired France to World Cup victory in Russia with four goals. One of those came in the 4-2 final victory over Croatia as he became just the second teenager after Pele in 1958 to score in the championship match. He was also voted Young Player of the tournament and has since become Ligue 1's leading scorer with 11 goals as Paris Saint-Germain run away with the French title. Messi and Ronaldo have won the last 10 Ballon d'Or awards and Mbappe believes that they are still the sport's top A-listers. "Nobody is doing better at the moment and we can't say it's the end of their era because it will only end when somebody else does better than them," Mbappe told AFP. However, the young striker added: "I don't think one of them will win the Ballon d'Or this year because it was a World Cup year, and the World Cup takes precedence." While Mbappe thrived at the World Cup, Messi's Argentina and Ronaldo's Portugal bowed out in the last 16. "But if you take the player in the purest form, there's nobody better yet. This year they were again the best two," added Mbappe. "Messi finished the best goalscorer in Europe; Ronaldo was the top scorer in the Champions League." 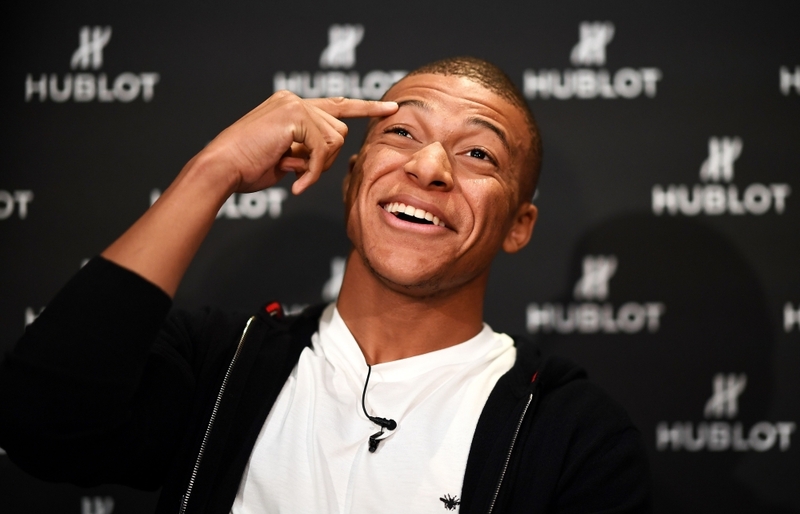 Mbappe was speaking to AFP on Thursday at an event organized by watchmakers Hublot, one of his leading sponsors. The last French player to win the coveted Ballon d'Or was Zinedine Zidane after the national team's 1998 World Cup victory. "Frankly, I hope so (win the Ballon d'Or). We achieved something big. It would not be unjust because that is a strong word, but it would be a shame if a Frenchman does not win it. We made history and it would be nice to be rewarded." Croatia's Luka Modric, voted Best Player of the World Cup, remains favorite for the Ballon d'Or. However, Modric is 14 years Mbappe's senior so the young Frenchman has time on his side. He will also have time and opportunity to complete his journey from the tough streets of the down-at-heel Paris suburb of Bondy to a life of super-riches. Mbappe, who will turn 20 just before Christmas, signed for PSG from Monaco for 180 million euros in 2017 in the second most expensive transfer of all time —behind PSG teammate Neymar who cost the French champions 222 million euros. Off the field, he seems destined to match Ronaldo in the commercial stakes. Will his initials "KM" match the brand power of Ronaldo's "CR7"? "I don't know because CR7 is something big, he has managed to build his brand and become international," said Mbappe. "Mine is not at this stage yet, I'm changing little by little." That development into the public consciousness saw him dominate the front page of Time magazine in October with the American publisher breathlessly showcasing the teenage as "the future of football". Mbappe said that he will not be satisfied with winning just one World Cup. When asked what he wants to win next, he said: "All the World Cups that I can play. "I play to win; if I play four World Cups then I want to win four. We go step by step. I have already won one. You have to prepare and win with your club and with the national team also. "There are short-term goals before thinking about the 2022 World Cup. But the aim always is to win." On being tipped to be the next true superstar once Messi and Ronaldo have retired, Mpabbe added: "I cannot control everything that is done and said.